This historical drama stars Florence Vidor, Edmund Lowe and Emmett King. 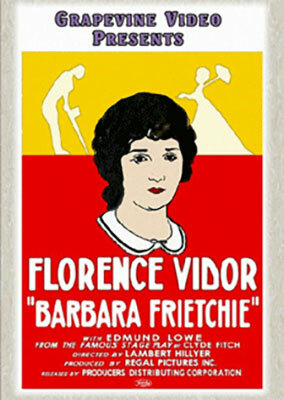 Barbara Frietchie (1924), black & white, 77 minutes, not rated. Grapevine Video, no catalog number, UPC 0-29502-80997-3. One single-sided, single-layered, Region 0 NTSC DVD-R disc, 1.33:1 aspect ratio image in full-frame 4:3 (720 x 480 pixels) interlaced scan MPEG-2 format, ? Mbps average video bit rate, ? kbps audio bit rate, Dolby Digital 2.0 mono sound, English language intertitles, no foreign language subtitles, chapter stops; standard DVD keepcase, $16.95. This DVD-R edition has been likely mastered from a 16mm reduction print. The film is accompanied by a theatre organ music score performed by Blaine Gale. 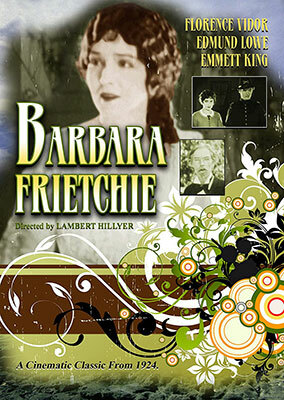 Barbara Frietchie (1924), black & white, 103 minutes, not rated. TeleVista, no catalog number, UPC 0-29502-80997-3. One single-sided, single-layered, Region 0 NTSC DVD disc, 1.33:1 aspect ratio image in full-frame 4:3 (720 x 480 pixels) interlaced scan MPEG-2 format, ? Mbps average video bit rate, ? kbps audio bit rate, Dolby Digital 2.0 mono sound, English language intertitles, no foreign language subtitles, chapter stops; standard DVD keepcase, $19.95. Release date: 28 April 2009. This DVD edition has likely been mastered from a 16mm reduction print. The film is likely accompanied by a soundtrack compiled from preexisting recordings. USA: Click the logomark to purchase this Region 0 NTSC DVD edition from Amazon.com. Your purchase support the Silent Era website. Canada: Click the logomark to purchase this Region 0 NTSC DVD edition from Amazon.ca. Your purchase support the Silent Era website. Other AMERICANA FILMS of the silent era available on home video.